At many levels, Max is child of few demands. He has some basic requirements for contentment like cold over hot, dry over wet, opera over any other music. Those who know Max perceive things he enjoys like twinkling lights, fast movement, and all things yellow. His easy going demeanor offsets the prolific demands with raising a child with such rare medical conditions. These demands affect our lives in such nuanced ways as what time we can go somewhere to eat, how we spend our free time and money, or where we choose to live. We live between the worlds of a child who is easy to please but brings life-shaping challenges. When a child like Max expresses the subtlest of joys or desires, parents will shift planetary orbits to try and figure out how to make their wishes come true. With Max, there are so few things we can give him. We can't give him the ocean or England. We can't take him to operas easily. We can't make his body work as it should. For many years there is a desire that Max has expressed. He has had opportunities to glimpse the reality of this desire but not the possibility of fulfilling it until now. While humans bring the baggage of their ignorance, discomfort or lack of understanding into their interactions with him, Max has never met a dog who was not incredibly intrigued by him. Dogs express a sixth sense, somehow knowing Max is special, to be loved and protected. At times Max has been ill, dogs have been cautious and comforting to him. When he is well and happy, they seek to be around him and celebrate his excitement with him. For years, Max has expressed the desire for a dog named George. As we've mulled this over the years, we needed to find a breed that would be intelligent, hypoallergenic, and tolerant of Max's outbursts and movement. We have investigated service dog organizations but they typically only use labrador or golden retrievers. Neither of which works for his allergies. 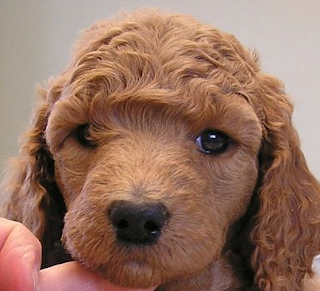 Years ago, Deana identified standard poodles as strong, intelligent, hypoallergenic dogs. Could a large standard poodle be a good choice for a service dog for Max? We've had opportunity to see a few Standards in public who are always keen to see Max. Family friends have standard poodles and labradoodles with good results. 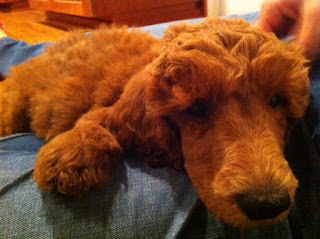 A few weeks ago we learned of a breeder of red standard poodles about ten minutes from our house. We arranged a time to go meet the family, the standard poodle parents and the puppies. The standard poodle parents were attentive, intrigued by Max, and instantly loving to all of us. The litter of puppies climbed over each other trying to get to us. The adults would stay close to Max, allowing him to pet them despite his erratic movements. They nuzzled his hands and smelled him rather than us because he was the intriguing one. Max was allowed to hold one of the puppies. We helped him rub his hands through the puppy's coat, rub his head against it's face and body. Both the puppy and Max loved the attention from each other. When he was nearly done holding the puppy, Max found the puppy's leg and held it in his hands. This was unprovoked or assisted by us. For any of you who knows Max's fine motor skills, you know how rarely he can find the hand coordination to hold anything. Yet he mustered it up to hold this puppy's leg. We've done a lot of research regarding ADA rules about service dogs. We've found what is necessary for a standard poodle to be identified as Max's service animal. We've identified training that can occur with the service animal living in our home. And we've found a breeder who has a recent litter. Now we need to raise the funds. $2,000 will cover the costs of the standard poodle and the initial service dog training. Max's birthday is at the end of the month. We're making a fundraising push for the next couple of weeks to see if we can raise the necessary funds to secure his service dog. If you are friend or family who is considering getting Max a birthday present, would you instead put it toward his service dog fund? If you are a Max supporter who would simply love to see him have the benefits of canine service and companionship, would you consider giving some to his fund? Twenty people who can give $100? Forty people who can give $50? How about $5 or $10? Anything you can do helps. Can you help Max find his George? If you would be willing to donate via Paypal, please click the link below. To contribute via other means, please contact the Trustee. Thanks Jen, dogs are so amazing! It's wonderful that your dog has a special relationship with your daughter! Hoping Max gets his birthday wish! I actually know someone in canda who has a standard poodle as a service dog. They are actually really intelligent and some service dog organizations are using them more and more especially ones that do not do their own breeding on site and evne those that do are starting to see the good in poodles.